"Pris" @ Blade Runner 2049 Premiere in Huntington. This character comes from the original film. "This [discovery] breaks the world ," as a "game changer, utters Lt. Joshi (Robin Wright) to Blade Runner (replicant assassin ) "K" (Ryan Gosling), after he "retires" (no, that's not delivery of a 401k package!) a rogue and discovers a secret burial site. "What you saw, did not happen," she orders the reluctant hunter. K and Los Angeles Police Department Lt. Joshi live in an era where human share the earth with their own creation --- replicants, which are essentially android slaves and hologram companions. Despite knowledge of their manufacture, he ponders soulful issues. A majority of the mindbending mysteries relate to what's real (or shall I say WHO) and what's implanted. Expect endless iconic philosophic and interpretative fan debates. Drifting back to the original 1982 film which has had no less than five "versions" released, Harrison Ford plays Rick Deckard, who in 2019 hunted four rogue androids, however, instead of completing his mission in the dark, rainy L.A., he falls for a dark haired replicant named Rachael. The original featured Daryl Hannah as "Pris", a pleasure robot, too. Suffice that Deckard runs off fully enamored by Rachael. Neither have been seen in 35 years. Ridley Scott, director of "Blade Runner," in interviews stated that Deckard himself was bio-engineered . Ford disputed that. The semi-embargoed story seamlessly shifts from satire to tragedy to romance and mousey thriller. K has a loyal hologram buddy , Joi (Ana de Armas), who tags along courtesy of a portable projector. One of the best lines, comes when a woman at a bar tells him, "you don't like real girls, do you?" 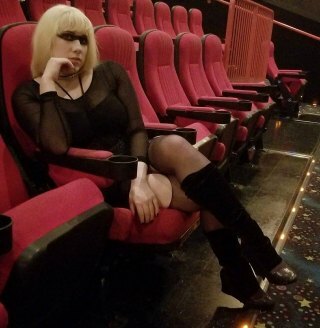 Cosplayer "Pris" (Bunny Bombshell) awaits premiere of "Blade Runner 2049." Daryl Hannah played Pris, a pleasure bot, in the 1982 film. Photo by Tony Rutherford; Model Bunny Bombshell. Shout out thank you to Charlotte & Marquee. ALL action and interactive diversions occur on planet Earth, not some far away galaxy or star. "2049" has received reviewer praise from about 50 writers and "mixed" classifications from four. I join the category and place it among "Avatar," "2001 a Space Odyssey," and "Soyent Green." The nearly three hour film relies on detective work, character development, and tantalizing puzzles prior to lasers, fists and sparks flying for a finale. A few "slow" assertions are insulting; it demands intense concentration by paying attention. Incidentally, during a 2015 interview Ridley Scott said there could be up to FOUR sequels to Blade Runner 2049.